Escalators are normally not thought of as a dangerous way of transportation, though there are times where escalators can actually be very dangerous, and sometimes deadly. The reason being is that many escalators go upwards or downwards, either to or from a higher floor. At times, the person riding the escalator may be very high above the ground, and falling off could lead to a serious injury, if not death. Here are the top two causes of escalator accidents. Horseplay is one of the most common causes of escalator accidents, and it can also be the reason for some of the most dangerous escalator accidents. Many younger people think it is fun to run up a downwards moving escalator, but this is usually not allowed as it can lead to the kid tripping and hurting themselves on the escalator. This is usually not a very serious problem, injury-wise, but other kinds of horseplay can be far worse. Some teens make it a game of jumping from escalator to escalator. This can be extremely dangerous if they are jumping from high above the ground. There are many cases of this worldwide, sometimes even leading to death. Escalators, like any other piece of equipment, can malfunction. There was a serious case in a foreign country, in which the escalator made a sudden halt, causing everyone on the escalator to be thrown to the ground. Luckily, no one fell over the edge, but it still led to a number of mild to serious injuries. 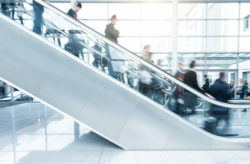 If you or someone you know has been hurt on an escalator, and it was not their fault, an experienced personal injury lawyer may be able to help you get the compensation you deserve. In your search for an attorney, consider contacting Stoloff Law. We will fight for your right, and get you what you deserve. Contact our offices today to schedule a consultation.